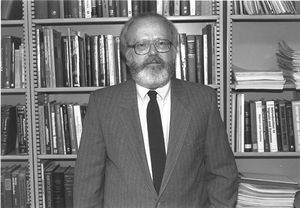 Charles M. Wolfe, considered to be one of the foremost experts in electron device research in the world, was a co-recipient of the 1990 IEEE Jack A. Morton Award. He received this honor, along with Gregory E. Stillman, "For the growth and characterization of ultra-high purity gallium arsenide and related compounds." Wolfe was born in Morgantown, West Virginia in 1935. He attended West Virginia University, where he earned his bachelor's and master's degrees in Electrical Engineering in 1961 and 1962, respectively. He received his PhD three years later from the University of Illinois. Wolfe is a member of the National Academy of Engineers, the recipient of the 1978 Electrochemical Society Electronics Division Award, and an IEEE Fellow. He is currently the Samuel C. Sachs Chair of Electrical Engineering at Washington University. This page was last edited on 20 January 2016, at 17:12.